fldigi - Digital modem program for Linux, Free-BSD, Apple Mac OS X, Windows XP, NT, Win2000, Vista and Win7. "Some of the best ham radio software available for the Mac - or any platform for that matter!". Since 1991 Dog Park Software Ltd. has been committed to providing the Amateur Radio community with the very best in Amateur Radio Software so that Hams using the Macintosh platform around the world can enjoy the same computer-radio interraction and enhancement that PC Hams take for granted - but with the added flexibility, security, user friendliness and stability that Macintosh users are accustomed to. Ham Radio Deluxe (HRD) is a suite of Windows programs providing computer control for commonly used transceivers and receivers. HRD also includes mapping, satellite tracking and the digital mode program Digital Master 780 (DM780). Ham Radio Deluxe is now a commercial piece of software. The people at Ham Radio Deluxe have allowed us to distribute all of their old versions as long as we do not charge for the software. Also, Ham Radio Deluxe no longer provides support for these versions. We are glad to be able to provide you with this software. DigiPan stands for "Digital Panoramic Tuning" and brings the ease and simplicity of PANORAMIC reception and transmission to PSK31and PSK63 operation. DigiPan provides a panoramic display of the frequency spectrum in the form of an active dial scale extending the full width of the computer screen. Depending upon the transceiver IF bandwidth, it is possible to "see" as many as 40 to 50 PSK31 stations at one time. 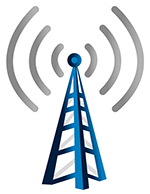 EchoLink® software allows licensed Amateur Radio stations to communicate with one another over the Internet, using streaming-audio technology. The program allows worldwide connections to be made between stations, or from computer to station, greatly enhancing Amateur Radio's communications capabilities. There are more than 200,000 validated users worldwide — in 162 of the world's 193 nations — with about 5,000 online at any given time. The programs SatPC32.Exe (in the following: SatPC) and Wisat32.Exe (in the following: Wisat) calculate the tracks of earth orbiting satellites. The calculations are based on the SGP4/SDP4 model, the results therefore are highly accurate Both programs are included in the SatPC32 program package. SatPC displays the audibility-areas of one or several selected satellites within a world-map and shows the results in text-lines below the map. Wisat represents the satellite positions in real-time in list-form. Both programs update their calculations continuously in steps of one second. The differences between SatPC and Wisat result from the absence of the graphic output in Wisat. Orbitron is a satellite tracking system for radio amateur and observing purposes. It's also used by weather professionals, satellite communication users, astronomers,UFO hobbyist and even astrologers. Application shows the positions of satellites at any given moment (in real or simulated time). It's FREE (Cardware) and it's probably one of the easiest and most powerful satellite trackers, according to opinions of thousands of users from all over the world. XMLog is an amateur radio logbook system for Windows 95, 98, ME, NT, 2000, XP, Vista, and Windows 7. MixW is a multi mode multi functional software for every day logging and Contests. It has many useful features that make your QSO logging process almost a 100% automatic procedure. You may download fully functional 15-day trial version of MixW and try it for free. This website has serveral programs for the ham radio community. Worth taking a look to see if they have anything that may interest you. Just Learn Morse Code is designed to make it easy to learn Morse code, as well as improve the skills of those who already know the code. The basic methods used to achieve this are Koch's method and Farnsworth timing.